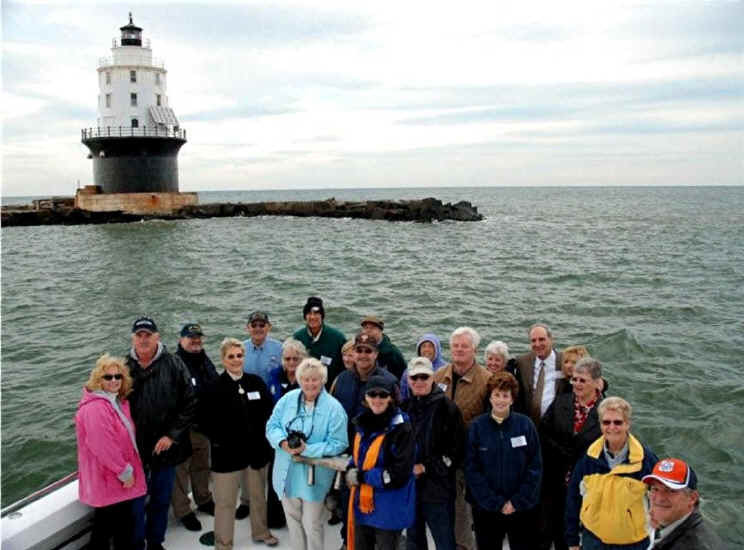 The Foundation has scheduled tours to Harbor of Refuge and Delaware Breakwater East End on five Saturdays during 2010. Following the 2009 practice of having one tour and one work trip each month, five Saturdays were also designated for work trips. Tours will be conducted on May 22, June 19, July 24, August 21, and September 11. Specific times for each tour will be announced later. Times are set to take advantage of the best tide for landing at Harbor of Refuge. Mark your calendars now, but please do not call before March 1, 2010. No reservations will be taken until that time. From March 1 on, call the answering service at 302-644-7046 for assistance. Please remember that everyone who works on the tours is a volunteer. It may be a day or two before your call to the answering service is returned. Be patient, but rest assured your reservations are important to us and someone will call back! 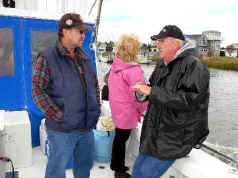 Prices for the three-hour tour to the two offshore lighthouses will remain at $75 for non-members and $65 for members. To read more details for the tours, click [Tours]. 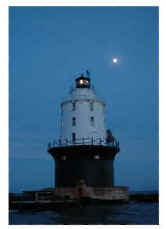 Work trips will be made to Harbor of Refuge Lighthouse on May 8, June 5, July 10, August 7, and Sept. 18 or 25. To get on the list of volunteers, call the answering service and ask to have Red or Judith contact you. All work at the lighthouse (except installation of the new door) is done by volunteers, so help is needed and always very much appreciated. Pick one or more of the above work dates now and let us know we can depend on you to help out. 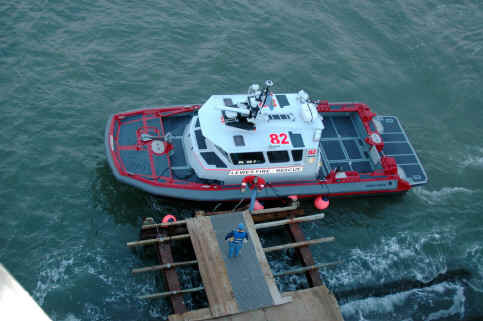 82-Marine-1, the new fire-rescue boat at Lewes Fire Department idles beside the dock at Harbor of Refuge Light Station as State Fire Marshall Timothy McClanahan joins Foundation Board Member Red Moulinier to inspect the lighthouse. Foundation Board Members listen while a fire safety specialist gives suggestions for improving safety precautions for volunteer workers and tour participants at the lighthouse. (left to right) Jerry Perrin and Red Moulinier, foundation board members, Gina McClanahan and Tim McClanahan, fire company volunteers, and John Gordon, foundation board. 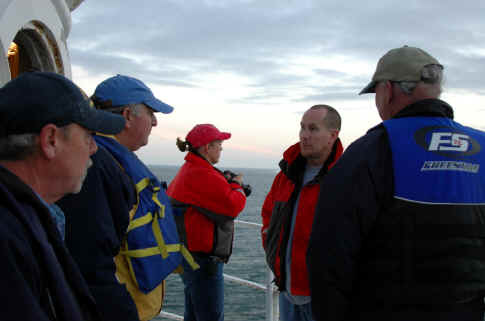 On October 30, members of the Lewes Fire Department and the Delaware River & Bay Lighthouse Foundation joined forces in a training exercise intended to familiarize fire officials with the layout of Harbor of Refuge Lighthouse and what they might encounter if a real accident or fire should occur there. Since the most likely emergency at the offshore structure would be an accident or illness involving a tour participant or a preservation volunteer, fire officials focused particularly on how they would evacuate a patient from high in the tower to the fire-rescue boat below. They praised the foundation for the safety precautions already in place, but chided volunteers for not getting the seven fire extinguishers inspected and tagged this year. They also recommended that all first aid kits be refreshed annually and insisted that "No Smoking" signs be placed throughout the lighthouse. 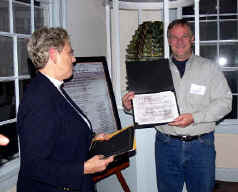 Foundation Board President Judith Roales presents certificate of appreciation to Fred Calkins Jr., president of Railway Specialties Corp., makers of the new door. 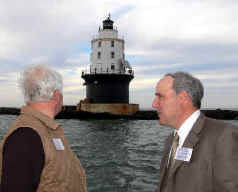 Foundation Member Ted Becker, owner of The Inn at Canal Square in Lewes, and Charles J. Myers, U.S. Army Corps of Engineers project director for Harbor of Refuge talk about upcoming repairs to the breakwater that will be made by the Corps. and Harry Faulls, who directed the actual installation of the door for the U.S. Army Corps of Engineers, discuss the Corps work during the door project. 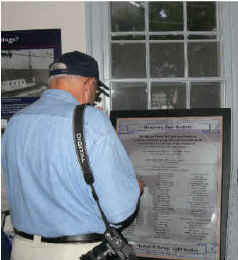 Charles Stevenson, who along with wife Sally, donated their Harbour Lights collection for the benefit of the door replacement project, reads the plaque that will be placed inside the lighthouse to commemorate those who worked and paid for the project.